I am excited for this week. The weather is going to turn from dismal to sunny and beautiful. We Oregonians deserve it. It has been pretty miserable for a few weeks now. We have only been able to escape outside in short spurts of breaks between the rainfall. To be safe, I only ventured out into my yard and this beaten up dandelion fluff caught my eye. Gorgeous! I love this shot. 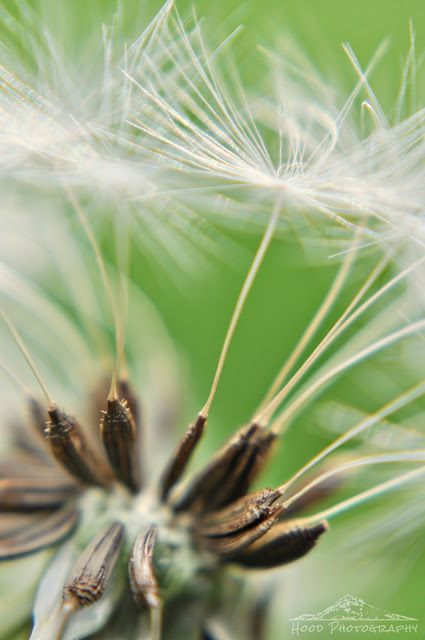 Such wonderful shot, very good photo work ..
stunning macro shot of the dandelion fluff! The humble dandelion in macro becomes a stunning work of art. Gorgeous. We have a love/hate relationship with these yellow beauties. This is beautiful! Enjoy the upcoming nice weather. What, you don't go along with the "Unstoppable" commercials for how rain doesn't stop us tough PNWers? I just put on my rain jacket and get out there anyway. ;-) Actually the heat stopped me yesterday, I was doing heavy work clearing brush and was drenched in sweat and had to quit. I also have a love-hate relationship with dandelions after they have taken over big patches of lawn, the yellow stage may feed some bees but the fluffball stage is a nightmare. But your macro is great.